The text for the Lincoln Invitation is artfully arranged to mimic the fluidity and movement of the floral motif. Elegant yet strikingly simple, the Invitation epitomizes Yuling's love for mixing and matching different typography in unique arrangements. The piece is one-color letterpress printed single-sided on luxuriously thick cotton cover stock with a textured tactility. The Lincoln collection embodies a modern approach to polished classics, exquisitely juxtaposing masculine and feminine details. With interrupted border detailing, a neutral palette, and a uniquely traditional floral motif, the pieces are mixed and matched on a variety of paper stocks from jet black to ecru white to natural kraft. 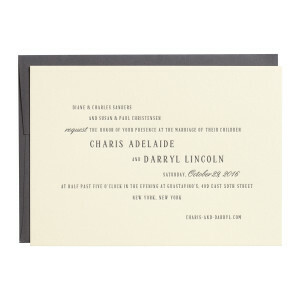 $1,708 for 100 two-color letterpress printed, or $1,269 for 100 one-color letterpress printed, or $507 for 100 flat printed Invitations and matching matte colored Envelopes. We are excited that you are considering our Collections for your wedding. To begin your order, add the pieces that you are interested in to your wish list and fill in your contact information. You should receive a confirmation email once you have submitted your wish list. Our design team will be in touch within 2-3 business days. Our business hours are Monday-Friday 10am – 5pm (EST). Yuling Designs is a creative design studio and stationery boutique based in the heart of New York City. Our studio is a place that celebrates and tells the stories of your work, love, and play.